When Duluth became a city in 1870, one of the first things Mayor J. B. Culver did was appoint Robert S. D. Bruce as the Zenith City’s first chief of police on April 21. Bruce, a building contractor, had no law enforcement experience—but he was a “big burly Scotch-Canadian who could handle himself in any fray,” according to the Duluth Police Department’s 1920 self-published history of the force. On June 3 Culver entrusted him with the payroll for a group of men working on a construction project. Instead Bruce absconded with the cash, never to be seen again. It didn’t get much better that first year: After a brief interim stint by George Berkelman Major J. L. Smith took over as chief. Duluthians considered Smith a “pompous individual who delighted in exhibiting his authority on any and every occasion.” They were done with him by December 14, when Berkelman took over again. It was December of 1870, and Duluth—just nine months old—was on its fourth chief of police. Ten years and four chiefs later, there was plenty of money—and crime—in Duluth. Thanks to the grain and lumber trades, Duluth pulled itself out of debt, and in 1887 became a city again. At this time the city also decided to build itself some decent facilities. At the time, the municipal court and city hall operated out of the second floor of the Hosmer block at 13–15 East Superior Street. The police department had a couple of timber-frame jails downtown and on Rice’s Point, and a simple headquarters adjacent to the County Courthouse and County Sheriff’s Home and Jail at Sixth Avenue East and Second Street. The growing department needed a larger home. 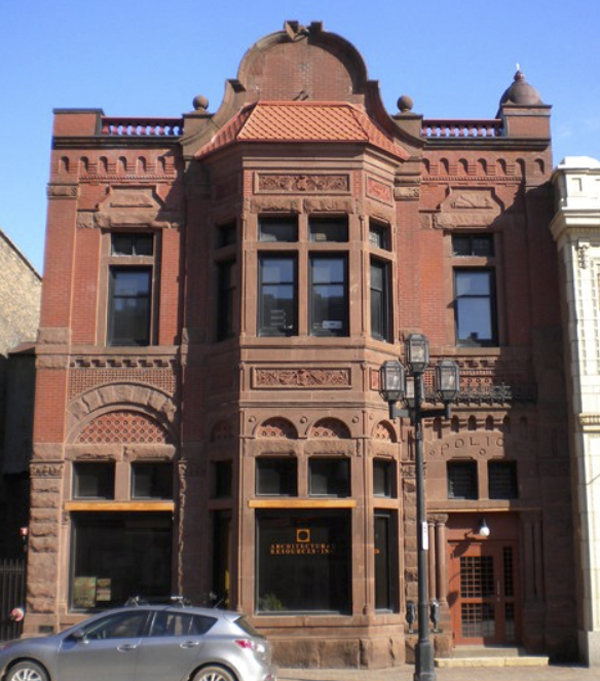 In 1889 the city began construction of a new City Hall at 128 East Superior Street, a Richardsonian Romanesque building designed by Oliver Traphagen. Next door at 126 East Superior Street sat one of Duluth’s primitive jails, built there in 1886. That building was torn down to make room for the new police headquarters and jail, another Romanesque masterpiece by Traphagen and his new partner, Francis Fitzpatrick. The police department used rooms on the first floor of City Hall from 1889 until the headquarters was complete in January 1891 for a total cost of $38,000 or $950,000 in today’s dollars. The front façade of the police headquarters is divided into three sections. The center section was originally a three-sided bay extending from the building’s base to the top of the building, two full stories—the bays have since been removed so that more modern, efficient windows could be installed. The main entrance, in the furthest-right section, was originally accessed through raised-panel double doors. These have been replaced for more efficient and secure doors, but the originals are still stored within the building. Above the entry’s transom windows—glazed with beveled glass—a carved sandstone lintel displays the word “Police.” Two dome caps—originally gilded and crowned by “long, needle-like metal spires”—once topped each corner of the building’s Superior Street façade, but the cap of the northeastern corner of the building is gone, as is the gold paint on its counterpart. An ornamental iron grate that once crowned the building’s gabled parapet now rests in the building’s Michigan Street level, awaiting restoration. The building’s first floor—the Superior Street level—saw most of its activity. The front half of the building held the police chief’s office and private room, a captain’s office, a sergeant’s office, and the female cell department, which included three 7 x 7-foot cells, each with a toilet and sink. The rear half of the first floor was itself split into two levels just 7 feet high. Each level housed 16 roughly 7 x 4.5-foot cells—32 in all—located in two columns in the center of the building, so that no cell was backed against an interior wall. Still, the exterior windows—inaccessible to prisoners in their cells—were covered with iron bars. Bathrooms for prisoners and police officers were located off the central corridor, which included a stairwell leading down to the basement and up to the second floor. The second floor was dedicated to the training and well-being of police officers. The front was a large drill hall for training, and the back was a dormitory where officers could spend the night. The Michigan Street level is also considered the building’s basement. Built in the days before automobiles, its main use was for the headquarters of the patrol unit, which utilized horses. It featured two sets of tall, heavy raised-panel, four-leaf doors set within massive Romanesque arches: this level originally served as the department’s stables and needed to be wide and tall enough for the horses and wagons that were housed inside. It included four stables (one was a spare) a driver’s room, and a grain room for feed. Beyond the stables was the patrolmen’s quarters and a battery room with electrical stores—Traphagen’s design anticipated the day when Duluth would be fully powered. Adjacent to the battery room and the patrol quarters was the vault, used to store evidence and other confiscated items. The basement had one more unique element, located between the stables and grain room: a manure chute. The building includes a partial subbasement, which essentially covers just the back half of the building. When first built, this room contained the coal bins and boilers that originally heated the building as well as a manure pit. Horse waste was thrown down the manure chute into the pit. When the pit was full the manure—and likely coal ash from the boilers—was loaded onto a wheeled cart, which then traversed a short rail system to the southwest corner of the building, where a hydraulic lift waited. The manure was then brought to the Michigan Street level and carted away.